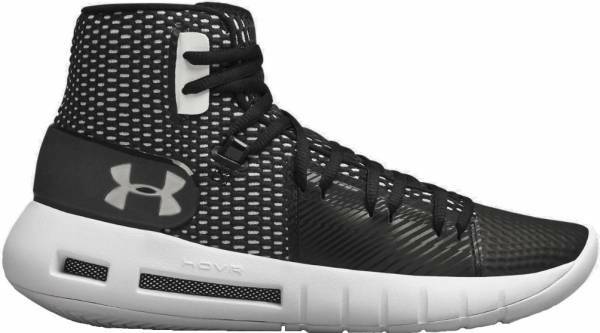 A handful of reviewers are happy that this pair of Under Armour shoes can really withstand a beating on the court. Fit is not an issue because the UA HOVR Havoc runs true to size. The rubber outsole is made thinner to reduce the shoe’s weight. A few users appreciate the resulting lightness. The EVA-HOVR cushioning setup effectively makes the shoe comfortable to wear. The Under Armour Curry 6 is also equipped with HOVR cushioning. Many users say that Under Armour is wise for using herringbone on the outsole; it makes the shoe grippy and stable. Several buyers are happy that this amazing shoe’s price is within the affordable range. The materials feel awesome, some wearers say. Many love how these UA shoes look. Just like the Nike Zoom Kobe 1 Protro, this model takes time to fully break in. Under Armour makes it big with the HOVR Havoc. This generally well-received model is said to be a lot better than more expensive options on the market today. Its midsole is composed of time-tested EVA and HOVR, which is a technology borrowed from the company’s running line. Its upper is made of two-tone mesh, and it just feels great on foot. The fact that this shoe is relatively affordable makes it a really attractive offer that’d be too hard to resist. The HOVR Havoc is a clever mix of old and new. HOVR is a running technology that crosses over to basketball. It is contained in this shoe’s EVA midsole to deliver impact protection and responsiveness. It is complemented by the proven and tested herringbone on the outsole. The upper has an amazing fit because of the two-tone mesh that it is made of. This breathable material has TPU hot melt film overlays at the forefoot to protect this usually vulnerable area from wear and tear. Cushion. The EVA midsole of the Under Armour HOVR Havoc contains the HOVR foam, which is still wrapped in compression mesh called Energy Web. The foam is wrapped so that its response and cushioning properties are activated. The EVA carrier has cutouts in its rear lateral side to not only reveal the technology HOVR within it but also to support its expand-and-compress function. Traction. Featuring the classic herringbone, the solid rubber outsoles of these UA shoes have good traction on any court type. When wearing these, both lateral and linear movements are satisfactorily supported. To make more natural flexions of the foot possible, the outsole has shallow grooves in the forefoot area. Length and Width. These basketball shoes from Under Armour are reportedly true to size; it won’t be a problem fitting in these. It will still be best, though, if you are able to try these on before you purchase. Lockdown. To deliver support, the HOVR Havoc features a unique lacing system that is structurally integrated with specific zones in the forefoot, midfoot, and heel. The shoe also has an external heel counter that asymmetrically extends well into the lateral side. This is done so that aggressive lateral movements are supported. Reinforcing this setup is the base; it is a bit extended at the lateral side so that gains outrigger-like properties. The exposed portion of the midfoot has a TPU shank that protects the wearer from twists. This Under Armour model features an upper that is made of two-tone mesh. This breathable material has TPU hot melt film overlays on high-wear spots like the forefoot. The integrated lacing system allows the shoe to more closely hug the foot, giving it a more streamlined look on the outside. The shoe also has a neatly placed Under Armour logo on the heel counter’s lateral extension. This model’s streamlined aesthetics make it such an interesting piece to match with casual and active wear.